Bullring, El Puerto de Santa María. On January 2, 1968, not long after daylight, our military plane banked near El Puerto de Santa María and I got my first glimpse of Spain: whitewashed buildings surrounded by palm trees in a sea of stubby vines surrounded by stark white soil, for the base at Rota lay near the Sherry vineyards between Jerez de la Frontera and Sanlúcar de Barrameda. As the plane circled before landing, I could not help noticing the circular enclosures which I would learn were bullrings, the big one at El Puerto de Santa María and smaller ones where I would one day find first hand that young fighting cows are tested for bravery. Spain was already beginning to fascinate me and I had not even touched the ground. The plane landed, physically in Spain, but on an American enclave, where I would stay for the next week, champing at the bit to discover my first foreign country. New arrivals were not allowed off the base until they had attended the don’t-drink-the-water, don’t-eat-the-food, don’t-get-in-fights-with-the-natives, don’t-molest-the-señoritas lecture, which was held once a week. Alas, for our just arrived group, the indoctrination lecture was not scheduled for nearly a week. All I saw of Spain during my first week in Rota were the glimpses I got on the daily bus rides to my work assignment at a large white security building, surrounded by a huge antennae field-- derisively known to the enlisted men as the “hum locker” because of the constant humming sound the antennaes made--where Navy linguists in French, Arabic, and Russian clandestinely eavesdropped on radio conversations from around the Mediterranean. From the perimeter road, across the strands of barbed wire that encircled the base, I saw men plodding along on burros past scrappy-looking farms with cottages, many of which in those days still had thatched roofs and in whose sparse environs grew cactus and palm trees. I saw little of the greenery and trees that I knew from my native Midwest; this was more like parts of California, perhaps even more barren. Still, those few glimpses were tantalizing and exotic. Burros, once common in Spain, now very rare. Finally, along with other new arrivals, we were given the indoctrination lecture and allowed off the base. I went to downtown Rota with a fellow sailor for my first meal in Spain: Spaghetti with meat sauce, served in an “American” bar, where Spanish and foreign girls, very few of whom were actually prostitutes, tried to keep lonesome young men engaged in conversation, thus keeping the wheels hot on the trucks that delivered San Miguel and Cruzcampo beer to the bars of Rota. The latest American rock music blared from a jukebox, continually reminding my compatriots of the girls they had left behind, perpetuating their homesickness and underscoring their determination to get out of “Mother Nav” and away from Spain, whose people some of them contemptuously referred to as “Moes” (or Moroccans) the name laid on the local Spaniards by sailors who had been transferred to Rota from Kenitra, Morocco. 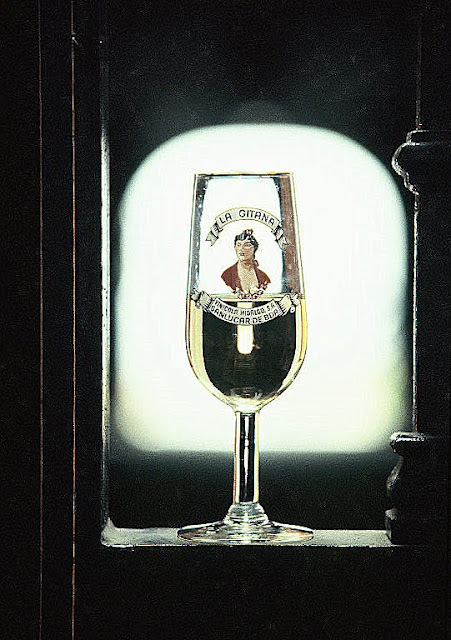 La Gitana Manzanilla, a Sherry made in Sanlúcar de Barrameda, about 10 miles northwest of Rota. Sanlúcar de Barrameda has long been one of my favorite towns in Spain. I knew men who spent two years at Rota and never got more than a few kilometers from the base. 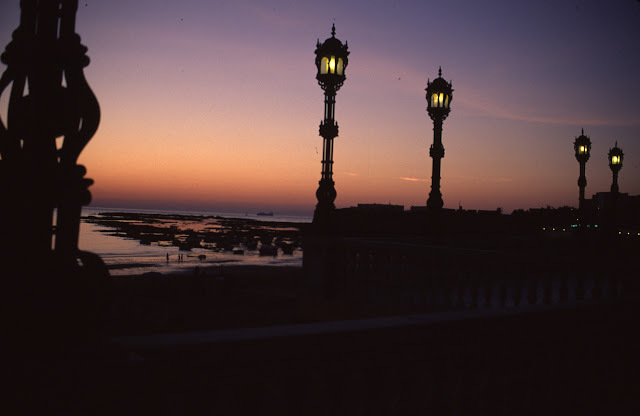 Once I lured one of them as far away as Cádiz, that wonderful, exotic seaport city across the bay from Rota, to see the sights, but he became so uncomfortable after a couple of hours, that he demanded we return to the Rota to drink in the American bars. I too joined the daily post-shift migration to the bars of Rota, drinking my share of drinks, playing my share of pool, telling my share of jokes, and trying, like hundreds of other enlisted men and officers, to woo the too many times wooed, often hardened, young women who served drinks. But, gnawing away at my insides was the thought that Spain was my chance to see Europe, maybe my only chance, before returning to small-town Illinois, where, with the help of the GI Bill, I would resume pursuit of my teacher’s degree at Southern Illinois University. But, in addition to hanging out in the bars, I continued reading about Spain, and like many others before and since, became enamored of Ernest Hemingway’s books, especially the ones set in Spain, For Whom the Bell Tolls and The Sun Also Rises, and in particular the latter, which drew on the experiences of the Paris-based Lost Generation. Influenced by images of Hemingway writing in cafés, I would sometimes sit for hours in a beach front bar in Rota and scribble in a notebook, my imitation prose flow lubricated by sherry or beer. Pleasantly surprised to come across your blog. I lived in El Puerto de Santa Maria from 1972 to 1976. I taught at El Centro Ingles. I'm wondering if you remember an old black and white photo that hung in a bar in el Puerto. 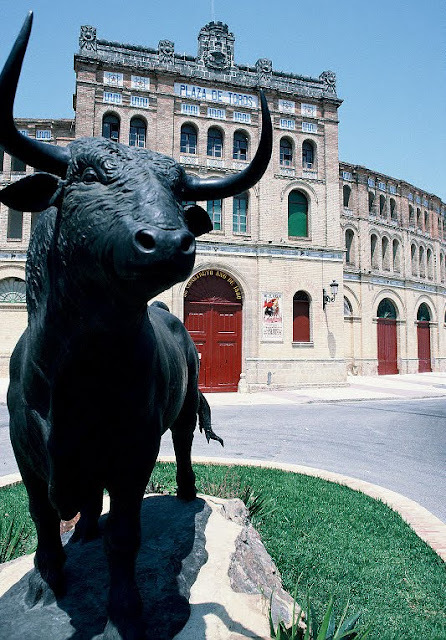 It was of a matador lying on the ground in the plaza de toros and the bull is on top of him, about to gore his eye. I'm wondering what the name of the matador is. Hi, sstaas, No I don't know who it was, but I know someone with encyclopedic knowledge who may know. I will let you know if he comes back with an answer to your query.